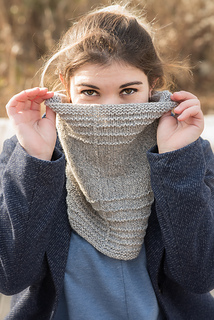 Lofty, lush, and decadently soft, this generous cowl will keep you warm in the frostiest weather. Named for the bustling thoroughfare that runs through downtown Toronto, Spadina Avenue (pronounced with a long ‘i’) is worked in the round, with simple texture and subtle shaping for good coverage. The pattern instructions are written, not charted. 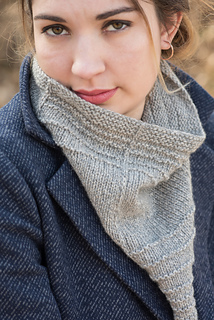 To make Spadina Avenue, you will need to know how to knit, purl, slip stitches and work in the round. Instructions for working the M1R increases are included in the abbreviations list. 18.5 sts & 31 rows = 4 in/10cm in stockinette stitch in the round, blocked. Exact gauge is not essential for this project, but differences in gauge will affect size and amount of yarn required. Blue Sky Fibers Eco-Cashmere is a lush, 4-ply, DK weight yarn spun from a 50/50 blend of recycled and virgin cashmere at a family-owned, environmentally conscious mill in Italy. This lofty yarn works well in a range of gauges, and the combination of airiness and extra-insulating fibres gives the fabric surprising warmth for its weight. The plying twist gives Eco-Cashmere a bit of spring, though it maintains the drape and exceptional softness of a cashmere yarn. 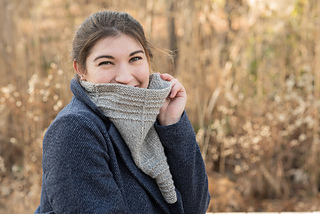 If substituting yarn for this project, look for a soft, lofty DK to light worsted weight yarn that gives a solid (but not stiff) fabric at the pattern’s gauge. You will need approximately 295 yds/270m.